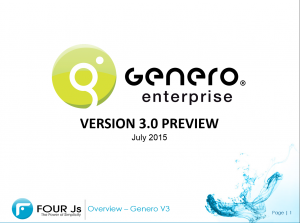 Irving, Texas – July 17, 2015 — Four Js Development Tools is preparing the next major release of Genero with version 3.0 being scheduled for General Availability Thursday December 17, 2015. Developers eager to evaluate its new features are invited to participate in the Early Access Program, which will open Thursday October 15. Four Js also takes this opportunity to reposition Genero within the product family by renaming it Genero Enterprise and giving it a smart new eco-green livery.